Physics Demonstrations in Light is a two-part video program which presents a full range of demonstrations in the areas of geometrical optics, physical optics, and the nature of light. Diffraction pattern produced by laser light passing through a circular aperture. Colorful pattern produced by thin soap film. 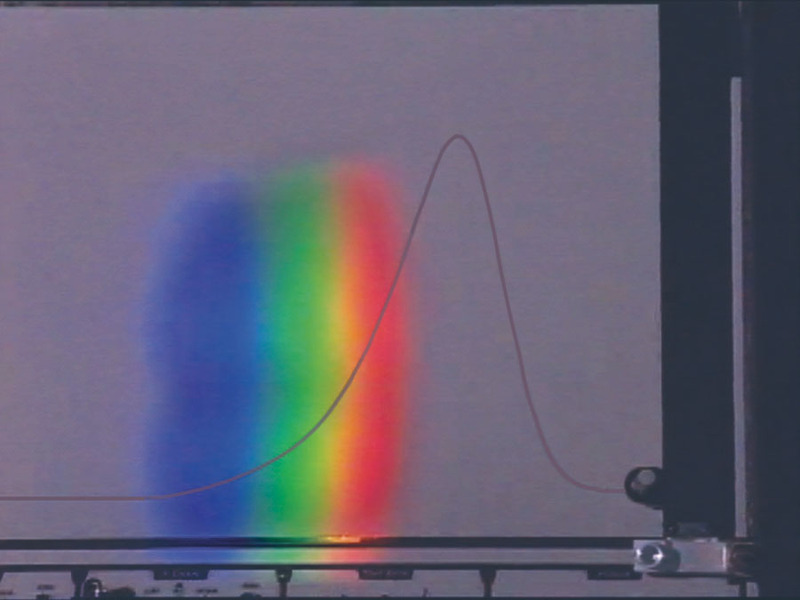 Incandescent light dispersed on a thermal radiation recorder revealing infrared radiation beyond the visible spectrum. Constructive and destructive interference arising from thin film of air between glass plates (monochromatic light). High power carbon dioxide laser capable of cutting through solid materials. Physics Demonstrations in Light is a two-part video program which presents a full range of demonstrations in the areas of geometrical optics, physical optics, and the nature of light. The program was developed in an effort to give physics teachers a comprehensive collection of video demonstrations, supplementing the instructor’s live classroom demonstrations. The program was designed to meet the needs of high school physics classes as well as introductory level college physics classes. Individual demonstrations are 3 to 4 minutes in length and can be quickly accessed using the program's on-screen indexing system. The indexing system allows the teacher to select a particular demonstration and show it at the appropriate time during a unit on light. The accompanying teacher’s guide gives additional data, information, and suggestions on using the demonstrations to promote further classroom discussion.